This upcoming enjoy an Easter fun weekend and a fun-filled day in the beautiful Paarl valley and head down to the beautiful Rhebokskloof Wine Estate. 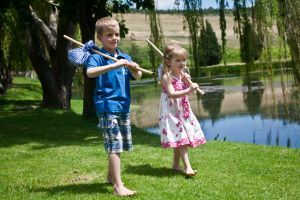 An Easter egg hunt in Rhebokskloof’s beautiful garden promises to entertain both young and young at heart while grown-ups can enjoy a tasting of the estate’s award-winning wines. An Easter culinary feast await at The Rhebok Restaurant with their renowned Sunday buffet lunch offering everything from freshly baked farm-style bread to traditional South African pickled fish, roast beef and much, much more. Lunch will be served between 12pm and 3pm and kids under 12 eat for free. Those who want to enjoy the last few days of summer in the outdoors, can book a scrumptious picnic basket to share on the estate’s rolling lawns. Kids get to do it Tom Sawyer-style with a classic stick-nic – a picnic wrapped in a cloth and tied to a stick as you can see in the picture above. A hiking trail, guided horse riding as well as quad-biking can also be enjoyed. Bookings are essential, to make a reservation or for more information, phone 021 869 8386. This Cape wine estate is nestled between two valleys at the foot of the majestic Paarl Mountain. Rhebokskloof Wine Estate is one of the oldest and most beautiful wine farms in the Cape Winelands and known for its award-wining Shiraz wines. from 10:00-15:00 for the duration of the Easter Weekend. The Rhebok restaurant will be open from 08:00-17:00 on Good Friday, Sunday and Easter Monday and from 08:00-22:00 on Saturday. Source: Thanks to Elize Engle at MagnaCarta for the info.